Inspiring youth to dream big and own the gifts they have within them was the common thread that wove together a packed venue at the Future is Yours annual career fair. More than 1,100 young people from across the province braved the cold and flooded Prairieland Park to learn about the bright future and vast opportunities that await them as they head into adulthood. One of the many exhibits at the Future Is Yours career expo. Check out our PHOTO GALLERY for more photos of the expo. The Future Is Yours is Saskatoon’s largest career expo targeting Indigenous youth aged 16 to 29 years and includes a wide variety of exhibitors from industries that interest young people, role models, expert speaker panels on education and entrepreneurship, entertainment, and skill building workshops. This is Saskatoon Tribal Council’s fourth year hosting the event as part of the STC-PotashCorp partnership, and has seen increased attendance year after year. Tyler Lafferty, who attended the event, is taking full advantage of the opportunity to make a change in his career path. At 22 years old, Lafferty began his career in entry level, general labour positions. He is hoping now to move into a more service oriented environment. “I’m looking for something that allows me to be more sociable with people, and build on that strength.” Tyler came dressed for success, taking the initiative to build a network of allies to help him navigate a new market. 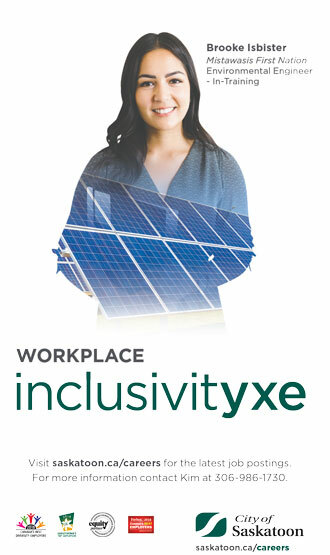 Leanne Bellegarde, PotashCorp's Director of Diversity & Inclusion believes that "when our young people choose to continue their education and enter the work world, they have the skills and determination to become a driving force in our province." The spirit of the room was that of a hopeful future, one that is inclusive, open and full of opportunity to just waiting to be realized.